Last week I accompanied my son to see The Martian, starring the talented and very engaging, Matt Damon. I regret that this review — really, observation — will add nothing to the laudatory din swirling round this blockbuster like the sandstorm that unluckily sets the nonsense in motion. First of all, Matt Damon is not engaging in his role as botanist Mark Watney. Gone is the freshness, the palpable gentleness-beneath-the- hard exterior, the quick-study neophyte unashamed of his emotions from previous films. What we get is a detached, self-satisfied geek who hasn’t the decency even to go on a food & drink binge when it’s apparent he has some free time. What bothers me the most about this ‘space epic,’ though, is that I’m not necessary. Look, I’ll admit it, I’m not smart. My only ‘first-ever’ is a dubious claim to having created the first art and culture show on commercial radio. My fellow creatures would be fools to harness themselves to me as their savior from a burning planet. 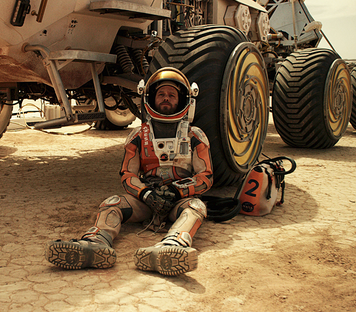 That said, I would appreciate my Everyman as embodied in Mark Watney to resemble me to some degree. Just as today’s gourmet food craze and “farm-to-table” orthodoxy heralds perhaps the future scarcity, or at least unaffordability, of quality food for many, I left this film with the distinct feeling that I would end my days not among the saved, the scientific elect, but clawing amid the crazed proles back on the surface. In conclusion, I freely acknowledge that The Martian is beautifully filmed. Watney/Damon is supported well by an ensemble cast featuring Jessica Chastain (today the Hepburn of Hollywood, given the volume of her recent work), Jeff Daniels, and Kristen Wiig. Unfortunately, this is not enough. I remember Marooned, with Gregory Peck, in 1970. It was simply slow and boring. But the near future depicted in The Martian trumps even that. It’s exclusionary. What we have here is the apotheosis of the wonk, the deadening triumph of science over heritage, over taste. Here we see a glimpse of a cruel new caste system, and are reminded in nearly every scene that most of us are not along for this ride.